A new year is a great time for fresh starts! Many an art teacher has promised themselves to be more organized in the new year(sometimes with the calender new year..sometimes with the start of a new school year). Organization can't happen if you are a hoarder!!! You have to be willing to get rid of "stuff". If you don't use something...get rid of it! If it doesn't work as it should...get rid of it! If you haven't figure out what to do with it....get rid of it! I know...I KNOW...our treasures are hard to part with. We might use it some day...it is a perfectly good (insert odd item we'd never buy ourselves)...someone gave it to me. Your room needs to function as a well oiled machine....and all the "stuff" gunks things up. Just because you are an art teacher doesn't make your classroom the junk yard. YOU CAN DO IT! Start small...clean out a cabinet or drawer! Throw out those dried up glue sticks/bottles. I did some classroom cleaning at the end of the semester last year, and I plan to do more today. It is hard to get rid of things that aren't broken, dried up, or empty, but just not something I ever use! But, I ended up giving three boxes of craft supplies (things I can't imagine my students making fine art out of) to my neighbors. They're a home school family, and their kids love to do arts and crafts! 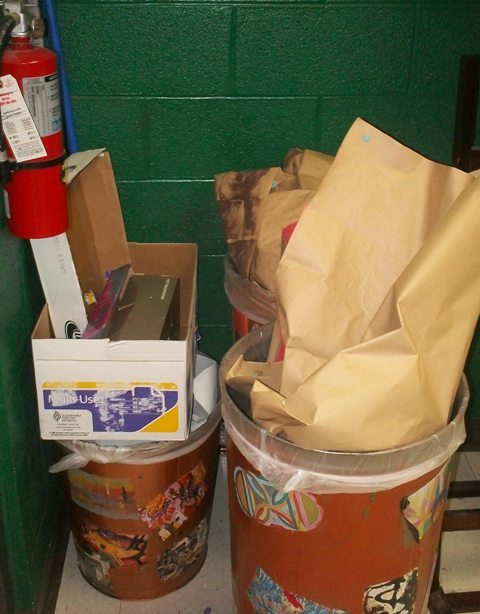 I'm glad they took my junk, because I hate throwing perfectly good things out (even though I'm pretty sure my room is the smallest classroom in the school). Jessica..sorry to hear your going back! :) ha ha We are out till Monday the 7th. Never before..never again will we get a Christmas break like this!!! I'm blessed with a room that was designed as an art room..and is one of the biggest in the school. However...I started in a portable my first few years..and was in a regular size classroom for my first 4 or 5 yrs at this school. You're awesome...I know you make the space work. A good rule of thumb for me is have I used it in the past two years? A lot of my projects I'll do every other year (to keep things from getting boring for me). So if I haven't taught that project in the past two years; I'm likely to never get back to it again. Other good questions to ask yourself: Does it have a shelf life? What will I not be able to use before it goes bad? Did I take this material because a parent donated it and I felt bad if I threw the unwanted thing away immediately? Did someone give this to me because they thought I geniunely could use it or because they were cleaning out their own junk? Is it covered in dust or other allergins that could make myself or a student sick?